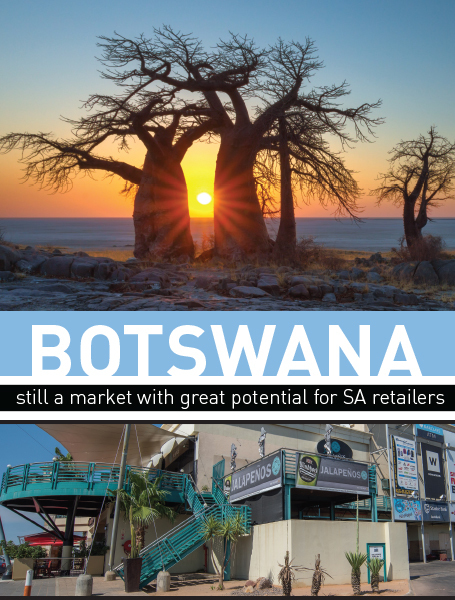 Botswana might be a relatively small retail market but it is a robust one, as those retailers who have operations there can attest. In fact, according to AT Kearney’s African Retail Development Index for 2015 (the most recent available), Botswana was the second most attractive retail market after Gabon. So while the scale of development there is small compared to South Africa, it is steady and responds to a stable and growing market. Shopping SA had the chance to chat to Gielie Visser of Nafprop (part of Cash Bazaars Holdings and the property managers for one of the established property funds in Botswana, namely New African Properties) about the market and its current ups and downs. The AT Kearney report points out that Botswana is often cited as a good example of what a country can achieve in Africa. Although it has a small population of around 2.3 million people, the country has a strong GDP per capita and a stable, well-developed economy driven by minerals (particularly diamonds), tourism and agriculture. Its currency, the pula, is also stable – and is presently about 30% stronger than the South African rand. 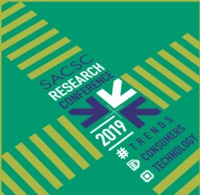 The country’s modern retail sector is well developed, underpinned by a number of active local and South African players. Spar, Shoprite, Woolworths, Pick n Pay and Massmart are all among the South African retailers represented there, whilst local chain Choppies is an excellent example of a thriving Botswana retailer. Choppies has over 70 stores throughout the country and has plans to expand further into other African countries, having already opened stores in South Africa and Zambia. There are a number of advantages for South African retailers operating in Botswana, as Visser points out. For one thing, retailers typically sell goods in Botswana with the same pula price label as the rand price label in South Africa – instantly giving them an effective 30% markup. “These businesses can do 30% less turnover and still make the same profit,” he comments. The absence of exchange control from Botswana means there is no limit on what South African retailers can repatriate in terms of their earnings. There is also no import duty on goods from South Africa into Botswana because of their being part of the Southern African Development Community (SADC). Labour costs are also lower in Botswana, adding to the list of items that potentially makes it an excellent opportunity for retailers to make good money. Visser notes that the Botswana government is committed to spending money on decent infrastructure for its people, saying that even the smallest towns generally have clinics, hospitals and respectable roads. Healthcare and education are also priorities, with the government providing anti-retrovirals for all HIV/AIDS patients, and sponsoring tertiary education anywhere in the world for local students who meet specific academic requirements. Probably the only disincentive for retailers looking to go into Botswana at the moment is what appears to be a temporary problem with trading licences for non-local retailers. As Visser explains, it has always been part of Botswana’s law that certain industries are priority industries for the Batswana people. Licences for general dealer stores and clothing stores in particular were reserved; however, for about fifteen years South African and other retailers simply applied for (and were granted) exemptions. “Approximately two years ago the authorities decided to start enforcing this law, and anyone who wasn’t a Motswana couldn’t obtain a trading license for these specific industries,” he notes. (Industries such as banking and furniture are unaffected). “This caused a problem for South African retailers who could no longer get licences, and for developers who had space built and leases signed but who were unable to fill their centres because the retailers are unable to trade,” he adds. Interestingly, although it might seem that not many retailers would be likely to fall into the general dealer category, the fact that many of them want to sell a variety of different goods technically puts them in that bracket in terms of the current definitions applied. The restriction on trading licences has put pressure on developers, property owners and retailers alike – and for the most part, local retailers are quite happy to have South African competitors in a centre with them because they add to the overall offering and keep customers coming. Forums and lobby groups have been formed to try and address the problem with the Botswana government, and although progress is being made, the issue has yet to be entirely resolved. One major South African retailer has reportedly been granted a licence after making a variety of commitments which include giving local traders free space in their stores to sell their wares, mentoring local manufacturers who can ultimately become suppliers to them, training local retailers and more. Even so, they will have to re-apply annually for their trading licences, and a new application has to be made for each new store. New African Properties Limited is the largest variable rate loan stock company listed on the Botswana Stock Exchange, and is invested primarily in retail properties in Botswana. Cash Bazaars started with a single store in Francistown and grew steadily, becoming a well-known retailer in Botswana. “Back then, when you wanted to open a new store, there weren’t premises readily available – so one typically had to buy a piece of land and build,” Visser explains. It was in this way that property development and ownership became part of what the company did. This expanded even further when the family started its furniture chain, Furnmart. Today, most of the properties are owned by New African Properties (and managed by Nafprop), and include some 80 properties with around 458 leases in place. The properties have a wide geographical spread within the relevant countries, with 57 properties in Botswana and 7 in Namibia. The acquisition and development of the properties was driven by the demand for retail property and as a result the majority of the properties are located in urban and semi- urban areas of Gaborone, Molepolole, Tlokweng, Maun, Kasane and Selebi Phikwe. Building one’s own property stock is still very much the way to do things, Visser points out. “It’s typically a five to six year process to get things done,” he notes. One has to lease land from the government on either a 50 or 100 year lease, and go through the normal development processes including environmental impact assessments, zonings and other approvals before one is able to build. What is in short supply is ready stock for South African funds and investors to come and acquire. For the most part, it falls to those who are happy to start from scratch to develop new properties for their portfolios. Nafprop is helping New African Properties to expand several of its centres around Botswana at the moment and to develop new centres that will be sold into the fund on completion. Riverwalk Shopping Centre in Gaborone is being expanded from its current approximately 29,000m2 to about 37,500m2. Whilst not the biggest shopping centre in the capital city, it is a more upmarket destination, generally attracting more affluent shoppers. With a good tenant mix and a highly successful food and entertainment offering, the centre has proven so popular that demand for space there is high. Riverwalk is currently anchored by Spar and Pick n Pay, and there is the potential for a third anchor. Woolworths might also expand its existing store. Some of the existing tenants which appeal to the more upmarket shoppers who frequent the centre include Exclusive Books, Cape Union Mart and the Body Shop. Confirmed tenants include new brands from Truworths and the Foschini Group, Clicks, Jet, Rochester, Bradlows, CNA, KFC, Pizza Hut, and Kauai. Additional parking will be required because of the additional GLA being constructed, and to this end, new deck parking will be built over part of the existing parking area to provide ample parking for shoppers. Galo Centre in Francistown, which is owned by a partnership between Cash Bazaars Holdings and Botswana Housing (not New African Properties), is being expanded from its current approximately 15,500m2 to about 22,500m2. The centre is currently anchored by Pick n Pay, and offers a fairly sizeable Woolworths and Edgars stores. It is also home to a mix of local and South African retailers. A large number of potential tenants have already confirmed their interest in taking space in the extended centre. These include Mr Price, Mr Price Home, Sheet Street, Miladys, Pep Home, Mr Price Sport, Incredible Connection, Markham, Sportscene, Exact, Pizza Hut and The Dros. The owners are also talking to a variety of other retailers, many of whom have expressed interest in taking space in Galo Centre. The parking will be extended, with deck parking being constructed on part of the existing parking area to provide ample additional parking. Situated next to the existing Airport Junction Shopping Centre in the northern suburbs of Gaborone, Airport Junction Value Centre is a proposed new 7,000m2 value centre. It will essentially extend the existing offering at Airport Junction Shopping Centre, adding two new big boxes which are able to accommodate a range of tenants which will expand the current retail offering and add value to the existing retail node. A number of local and South African retailers have shown interest in taking space, and Nafpropis is currently in the process of talking to potential tenants for the value centre. Palapye Junction will be a new shopping centre in the town of Palapye in eastern Botswana. The town, which is about 269km from Gaborone and 160km from Francistown, is home to just over 36,000 people. Cash Bazaars Holdings has secured the land and construction has commenced. The 9,000m2 proposed centre occupies a strategic corner site on the main road running from Gaborone to Francistown in one direction, and to Serowe in the other direction. Anchored by Spar, Palapye Junction will also be home to retailers such as Ackermans, Pep, Tops, CB Stores, Options, Studio 88, Topline, and JB Sports. The opening date for Palapye Junction is currently scheduled for late October 2017. Planning is also underway on a 6,000m² centre in Maun, between the bus terminus and the Shoppers store. Located in the north of the country near the Okavango Delta, Maun is the heart of Botswana’s tourism industry and is frequented by large numbers of international tourists. A new shopping centre is therefore likely to be well received.